My lords, ladies, and gentlemen, here it is! 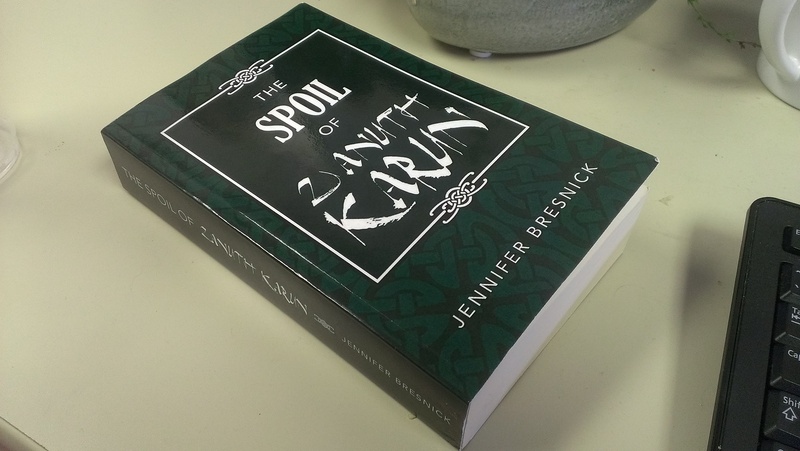 The very first physical evidence that The Spoil of Zanuth-Karun exists, and that it’s very nearly ready for its debut. While I haven’t quite put the finishing touches on it yet, and my beta readers still have plenty of time to get their comments in, I wanted to order a proof copy so I could see how the cover was going to look and make sure the formatting was all spiffy. It’s not as bulky and cumbersome as I thought it would be, at a slim and svelte 563 pages, so any talk about splitting it into multiple volumes is now over. It looks beautiful. You can’t quite tell from the cell phone pic, but the colors are rich and clear, the inside is elegant and readable, and the content isn’t half bad, if I do say so myself. My tentative release date is July 15, depending on when I hear back from my various copy editors. I will certainly update you if that happens to change. I’m really very, very excited about the way this has turned out, and I sincerely hope y’all will end up feeling the same way. Congratulations! I was just reading a study* that says readers prefer big books, so they recommended not dividing them. Good luck with the next phase of the marketing process. I agree! If I like a book, I want it to be as long as possible so there’s lots of it to enjoy. If I don’t like it, it doesn’t really matter how big it is, because I’m unlikely to read the whole thing anyway. Need to check this out. My “little” novel has grown to 320,000 words and it splits pretty cleanly in the middle, so I think I’m going to go with two books…but not three or four. I just purchased your book tonight and look forward to reading it. I have two novels completed, each are the 430-460 page range, and feel like you: it’s about content. Good stories can take on a life of its own and attempts to shorten them often take away more than it contributes. After reading yours, I will make a comment via Amazon.com, or directly to you if you prefer. Meanwhile, I am finishing up a fourth round of copyediting on my first novel to get it out the door before summer ends. My second novel has two copyedits completed, another is needed, and should be out the door this calendar year. My third novel has just begun (probably done during the winter). Who are your ‘beta’ readers and copyeditors? Please tell me your secret so I can get some! I love writing, but hate the editing process which delays bringing new stories to the table. Thanks, TJ! A review on Amazon would be wonderful. My beta readers were just a group of volunteers from the audience, and some literary people looking to get copy editing experience with fiction. Everything can benefit from an outsider’s perspective whether you like editing or not.